An oil and filter change helps keep your engine clean and properly lubricated so it can run more efficiently. Visit Quick Lane® Citrus Park and you’ll have three choices to get the maximum value out of your oil change. Each choice offers high-quality oil and filter products from Motorcraft® that are right for your vehicle and can help improve your gas mileage and extend the life of your vehicle. 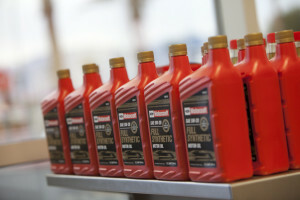 Quick Lane uses premium-quality Motorcraft® Synthetic Blend Oil with specially designed performance additives. It helps reduce damage-causing deposits, rust and corrosion and provides excellent wear protection. With The Works, you get an oil change and more, including a tire rotation, brake inspection, battery test and a Vehicle Check-Up Report to help you monitor your vehicle’s maintenance. The best way to take care of your vehicle is to follow the recommendations in your vehicle’s maintenance schedule, found in your owner guide and available on quicklane.com for certain vehicles. Whether it’s an oil change, spark plug replacement, engine coolant flush or anything else, Quick Lane at Citrus Park can take care of it all while you wait.